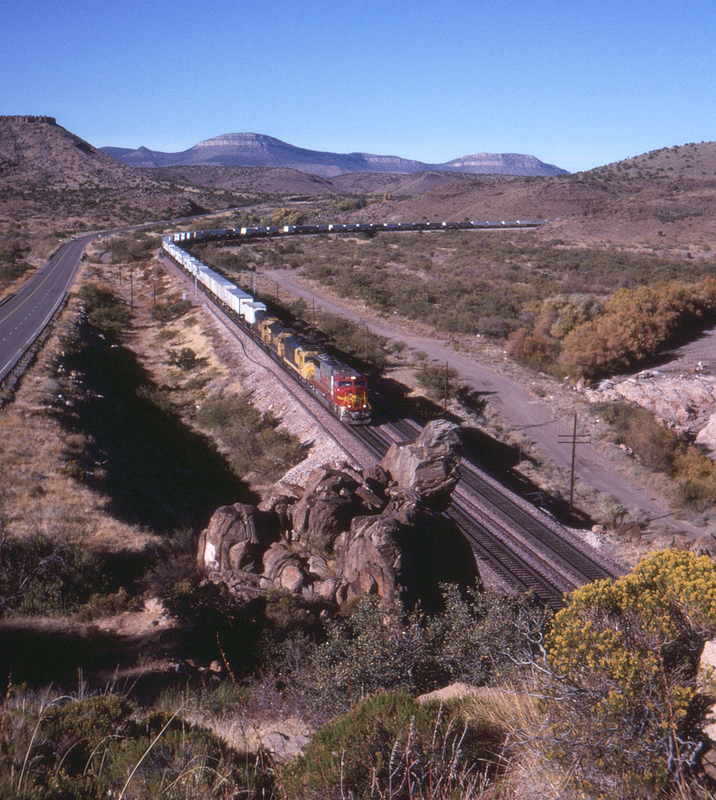 One of the scenic obstacles on the Santa Fe between Kingman and Seligman, Arizona is Crozier Canyon, which follows the Truxton Wash through a narrow passage between the cliffs. One of the advantages of trainwatching in this area is the presence of Old Route 66 (now Arizona State Route 66) which follows the mainline closely at places, with numerous useful perches for photography (or just lurking). Here at the west end of the Canyon we see a westbound freight freshly emerged from the canyon, with three blue and yellow "blondes" (does anyone still call them that?) led by a warbonnet unit apparently fresh from the washer. It looks like there's still plenty of piggyback traffic on the rails at this time.